2019 has started off with a bang in capital markets blockchain -- (1) a $20 million investment by Nasdaq in enterprise blockchain FX player Symbiont, on the heels of Baakt and ErisX, (2) a Security Token Realized conference well attended by financial services execs from companies like State Street, of which 70%+ owned BTC, (3) and meaningful technical developments and financial products from folks like Tokeny, Securitize, Templum, Atomic Capital and others. But let us shift to another leg of the crypto stool this year, which is staking-as-a-service. We recommend reading the Coindesk op-ed from Michael Casey linked below, which outlines how a transition from proof-of-work to proof-of-stake in Ethereum (if it ever happens) could lead to the intermediation of crypto deposit holding on behalf of consumers. If investors get paid for outsourcing private key management to custodians, argues Casey, we re-create the fractional banking system with its pitfalls, like counterparty risk and incentive trends towards leverage. We agree, but aren't immediately put off by the comparison because credit is the lifeblood of inter-temporal economic decision making. Staking reminds us of two things from traditional finance -- capital requirements for banks, and interest-bearing deposits within those banks. As soon as users realize that they should be getting some interest return from their outsourced cryptocurrency accounts at exchanges or custodians, there should be broad competition around this product. If Coinbase offers 3% while Binance offers 4% of staking rewards (or vice versa), the consumer choice becomes more clear. This is exactly what banks compete on in terms of attracting deposits. 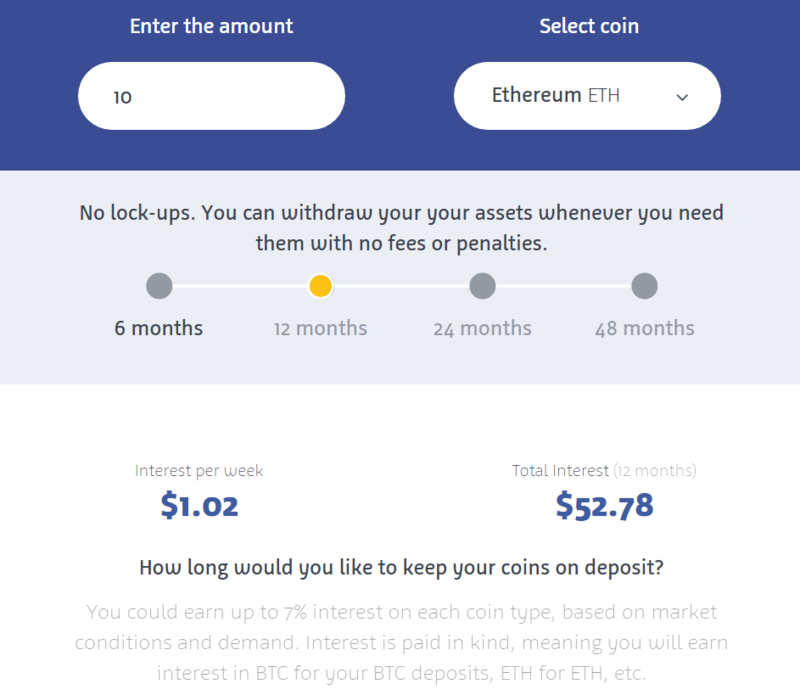 Users can already get an interest rate on their crypto for margin lending, up to 7% or so depending on the token. As an aside -- that margin lending may be a bad deal for the lender, since you are powering the short-selling of the capital asset you hold. You could also compare staking returns to dividends that corporations pay to their shareholders, as shareholders buy the equity and commit capital to an asset. Given that these staking rewards are raw inflation (rather than cashflow earned by a corporation), the dividends become a value transfer between holders that stake and those that do not -- a tax on the unsophisticated user. Also, a dividend by law has to be passed on to the beneficial owner, which is a good thing. But that's not very anarchist of us. First, none of the below is an endorsement of any kind, but only macro commentary on the strategic landscape. A lot of interesting developments around the upcoming Filecoin token launch. To recap, unlike nearly every single ICO to date, Filecoin is explicitly trying to launch within the framework of US Securities Law, and is doing so leveraging traditional institutional venture capital and angel investors. The sale is being run through CoinList, an offshoot from angel-investing / venture syndicate platform AngelList. It uses a newly created legal form called the Simple Agreement for Future Tokens (SAFT) and targets only accredited investors with an investment minimum of $500. But what is particularly interesting in this example are the implications of allocation and pricing. Filecoin is a decentralized file storage and computing platform built on blockchain, not unlike Storj or MaidSAFE. In principle, the token launch mechanism is a democratic crowdfunding in which users of the future project can participate the protocol level and benefit from their own efforts. And yet, the project has already raised $52 million in a token pre-sale ahead of the ICO from investors like Union Square Ventures, Sequoia, Winklevoss Capital, Digital Currency Group, among others. That investment happened at a discount to what the ICO price is set to be, in certain cases by an order of magnitude. Designing a price increase into the ICO merely one week after an original sale feels a bit like that time Steve Jobs got millions of backdated options. Not all crypto-economy participants are happy about this. To go even further, read this excellent analysis by Preston Byrneon why the SAFT helps issue tokens, but does nothing from a regulatory perspective to help trade them. Resale is different from offering. It is a conservative view, assuming that regulators will not want to encourage token launches through friendlier treatment. But nonetheless something to think about if your token looks like an investment contract, rather than internal software money supply -- an issue we covered in our ICO report. Participants in the Cryptoeconomy have cause for both celebration and fear as theSEC released a note that walked through its point of view on the Decentralized Autonomous Organization. This DAO was one of the foundational token launches given its large $150mm fundraise and subsequent $70mm+ hacking. Notably, it no longer exists and therefore the SEC note can be seen as guidance rather than punitive action. What does it all mean? The SEC note is not really new information, but a clarification. Any offering in the US is subject to securities laws, and some tokens/ICOs qualify as an offering. So it's not that the SEC has decided to regulate something that was previously outside of its jurisdiction. Rather, it is applying the time-tested Howey test to new phenomena, and finding that certain ICOs would qualify as investments under it. The DAO was a collective investment fund with the goal of profits for token holders, backed by Ethereum currency. This looks a lot like a security from a legal perspective, and so the SEC clarified that the existing laws do apply in the US. But that doesn't imply all tokens and ICOs are securities. There would be two strategies around public registration for Cryptoeconomy entrepreneurs: (1) either design tokens that are not securities under the Howey test due to their more functional nature, or (2) sell tokenized securities under an exemption to public registration, such as targeting only accredited or foreign investors. But not all cryptocurrency is a "security". See this spreadsheet that estimates the likelihood a token is a security. No deep mystery. Launches also don't need to happen in the US. In our own analysis, Singapore and Switzerland came out on top as Crypto-friendly countries, with the UK and China still processing how to create new rules. As a result, startups are pursuing structures that domicile in advantageous jurisdictions. That means the core of the Cryptoeconomy being outside the traditional innovation centers of Silicon Valley, NYC or London. If you are an ERC20 ICO investor or a IBM/Hyperledger developer or Bitcoin maximalist, please read the amazing 2005 science fiction book Accelerando by Charles Stross. Set in the timeline right before the Singularity, the book tackles the potential social and physical transformations that happen as the cognitions of humanity and software merge. Talk about a real futurist! Economics 2.0 is a system that is ‘more efficient than any human-designed resource allocation schema’. It 'replaces the single-indirection layer of conventional money, and the multiple-indirection mappings of options trades, with some kind of insanely baroque object-relational framework based on the parametrized desires and subjective experiential values of the players’. Human intelligence is incapable of participating in Economics 2.0 'without dehumanizing cognitive surgery. Doesn't this sound exactly like a pitch for a Token Launch / ICO that is used to power a Decentralized Autonomous Organization (e.g., the DAO)? Check out the screenshot below for what to many regular people will look as much like science fiction as the quote above. This is why so much of the feedback to our ICO analysis has been -- where are the real human businesses that will be built on top of these tokens? Where is the book store, and the grocery, and the barbershop? Spoiler alert: the Singularity does not end well for wetware. Last week, we released an industry analysis of the Initial Coin Offering market from an economic, financial, regulatory, legal and investor point of view. If you haven't yet, grab the analysis here. It was quite challenging to pick a time to stop writing the deep dive, as the market changes so quickly. And of course, once we stopped updating the numbers, the marketcap of Ethereum has fallen from $34 billion to $16 billion in the last month. This highlighted for us the volatility in the currency and the undesired consequences of current token market dynamics. We wanted to share some logic from the analysis that might be helpful in understanding pricing dynamics. Assuming that there's $80 billion or so of digital token value out there, most of it in Bitcoin and Ethereum, we can assume that early investors and large holders are interested in diversification. That's only natural, and generically investors often put 5-10% of their portfolio in early stage projects. By that crude metric alone, there is $4-8 billion of demand for new tokens. And ICOs have been the answer to date. Putting aside other best practices, let's talk about pricing. It looks to us like there just isn't a supply of $8 billion in good token projects yet. We have a hard stop due to a dearth of skilled developers and maturity of the ecosystem. This implies that allocation mechanisms (e.g., Dutch auctions, rolling auctions, etc.) are key -- projects prior to EOS and Tezos were essentially applying a good faith price ceiling, limiting how much the ICO raised in order to achieve realistic results. In the last month, that price ceiling has been lifted, and projects have been willing to pull in all demand, then cash it out of Ethereum,thereby creating the massive spiral we see now. Ouch. In the last two weeks, two Token launches have raised nearly $400 million equivalent in digital currencies like Bitcoin and Ethereum to support new visions of the future of computing. Or is it the Internet of Value? Or decentralized smart contracts? Wait, isn't Bitcoin the Internet of Value, and Ethereum the future of global computing? And where and from whom did this money get raised again? First, what we know. Tezos raised $207 million so far, and they are focused on being the blockchain "Swiss Army knife". That means unlike a general purpose smart contracts platform (Ethereum), functionalities are more precisely defined and validated. Internet sleuthing suggests that Tezos has more strict coding practices, i.e., it would be harder to create hackable smart contracts, and more formal governance. And as for EOS, it was supported by Brock Pierce of Blockchain Capital affiliation, and raised $185 million in the first five days of the launch with a Times Square billboard, despite not being actually offered to US investors. It's purported differentiation is speed and structured permissions. Enough for $400 million? Both token launches were uncapped, which means that the market is supposed to clear without a stop at how much currency can be raised. So if there's $10 billion of demand for diversification out of Cryptocurrency, then it may flow uncritically into these projects. It's also alarming that new token projects are not sticking to budgets and following the Coin Center best practices. Certainly some regulators walk by Times Square? They're everywhere, these Initial Token Offerings -- even the front page of the NY Times. Reactions to the massive run up in the cryptocurrency markets range from indignant scoffing to reasoned explanations of how to filter through the noise to Vitalik's analysis of market mechanics responsible for the outcome. Read all of them with healthy skepticism of the role of the writers in the industry and the current part of the hype cycle. But also, don't miss the forest for the trees. Although over 80% of Dotcom bubble IPOs were out of business by the year 2010, Amazon and Netflix now account for over $500 billion of industry-defining value. Recent projects on note include SONM, a fog computing platform that raised over $40mm equivalent in 4 days and Status, a decentralized version of WeChat that raised over $100mm and nearly broke the Ethereum blockchain. Those are very big numbers for what seem like projects with a Seed-stage venture capital profile. Seed stage traditionally goes to platforms like Angellist (thus no surprise in Coinlist) to raise $500k-5mm. So you may see the disconnect between the cryptomarkets and developed-world venture capital. As a data point in the other direction, the Bitcoin Investment Trust has now grown to $400 million in NAV since inception in 2015. To make strategic sense of these developments, we are working on an ICO industry analysis. If you're interested in the topic and would want to purchase this document with an early-bird discount, let us know. The last few weeks have seen ridiculous price swings in the most popular cryptocurrencies, Bitcoin, Ripple and Ethereum, which together account for about $64 billion of value. Same time last year, those numbers added up to about $10 billion. The names of the cryptocurrencies topped the list of Google searches as awareness has hit the mainstream. It is no surprise that Ethereum business summits are described by Coindesk as "hot and wild". The popular tech blog Stratechery compares the current environment to the story of the tulip mania (at least in spirit) and the early internet days. If the artists and hackers are right, an entirely new internet will rise from blockchain and smart contracts. The world will transform to have scarce digital goods and identity. If they are wrong, digital tokens have no inherent value and will fall to their marginal cost of creation (arbitrary and nearly $0). The prices of the coins are not particularly interesting to us as it is mostly a speculative ride on the sentiment of others. But what is really interesting is the derivative of this activity -- Initial Coin Offerings. Bitcoin and Ethereum swings are minting cryptocurrency millionaires, who are then funding other projects on a variety of blockchains using their digital money. Funding a $10 million project to completion, and owning the latest in public blockchain innovation, is quite cheap if you can make that cost back in the volatility of Bitcoin trading. That legitimate VCs like Union Square Ventures and Angellist are interested in these phenomena signals potential value. In particular, the CoinList project seems to try and legitimize ICO activity by only allowing US accredited investors to invest. Will they spend real USD the way that people spend Bitcoin? A common refrain is that Fintech is about democratization, providing services and benefits to underserved communities. From a cryptocurrency perspective, the entire world is underserved by the current economic structure, thus the rise of next generation services in Bitcoin, Ethereum, and others. But raw cryptocurrency psychology is incompatible with the existing social order, which still controls sovereign power and fiat currency. Therefore to access the benefits that digital tokens bring to the financial world, we need consortia like Hyperledger and Enterprise Ethereum. To create even more access to these objects as an investment class, the EtherIndex Ether Trust wants to launch an Exchange Traded Fund of ethers on the NYSE Arca exchange and the SEC is now reviewing whether to approve the proposed ETF. The Winklevoss twins of Facebook fame had tried to do the same with Bitcoin, and that effort was rejected by the SEC. It is widely believed that BTC benefits from networks effects for digital currency, given its marketcap of USD 23 billion. Ethereum is not a cryptocurrency but a computing platform, and it would be a surprise if it is able to access the legitimacy of ETF trading (and the investors that come with it) prior to its more well known cousin. On the other hand, Ethereum has spent more time courting the traditional financial industry, and now stands at a marketcap of USD 7 billion. Has this helped people forget last year's near loss of USD 75 million in the DAO meltdown? One thing that did surprise us about this event was the lack of engagement with the concept of Initial Coin Offerings. In a room of 100+ fintech entrepreneurs, investors, executives and regulators, less than 5% have even ever heard of an ICO. In the information bubble of certain communities, Ethereum-enabled ICOs will replace the entire venture capital asset class. This thinking is ahead of its time, and there are many legal and consumer-protection barriers that stand in the way of mainstream adoption. Lessons about ponzi schemes and market cycles are yet to be learned and will take years. To be clear, we think investing in ICOs is today equivalent to gambling. But still. If blockchain is being used by banks for creating digital currencies, digital bonds and digital equities, and access to capital has been democratized, what is the logical conclusion? That completely decentralized, smart-contracts based fundraising is a meaningful symptom to watch. What do you think -- pure speculation or black swan risk for investment management? Coinbase and Debevoise & Plimpton have published a legal framework for understanding Initial Coin Offerings. The document attempts to frame how to think about this emerging phenomenon, and do it in a way consistent with securities law. We have been watching the digital currency markets develop an extra-legal way to raise funds, which involves selling the tokens of an underlying blockchain to the public without going through the laws of a country. To date, these have been small, but there are standouts like Ethereum ($20mm) and the DAO ($150mm), each subject to immense risk. The interesting elements are that (1) the raises entirely sidestep the venture and public markets, and instead crowdfund directly, and (2) these are international events that intersect in unprecedented ways with sovereignty and law. If ICOs find a way to become mainstream and legally acceptable, this could impact the fundraising activities of investment and merchant banks. Read more.